Congressional Black Caucus members put back up high school student art removed from the Capitol walls by Alpine's very own art critic Duncan D. Hunter Jr.
As if absconding with tens of thousand of campaign dollars masquerading as a personal piggy bank or ducking an in-person town hall with his constituents weren’t bad enough, now this for embattled Rep. Duncan Hunter (R-50th District). He’s been served. By extension. 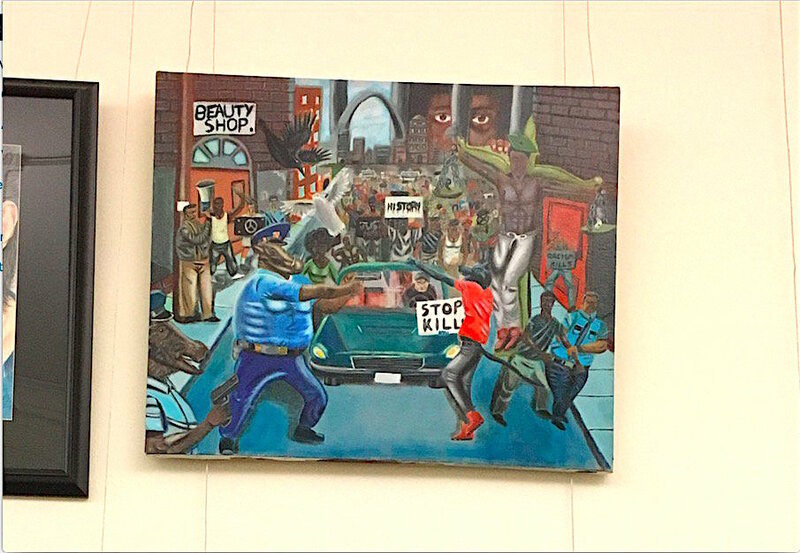 Rep. William Lacy Clay (D-MO) filed a federal lawsuit on Tuesday against the architect of the Capitol for removing a painting by former St. Louis student David Pulphus that depicts police officers as animals. Clay announced the filing of the suit at the federal courthouse joined by Representative Jamie Raskin (D-MD), a former professor of Constitutional law. 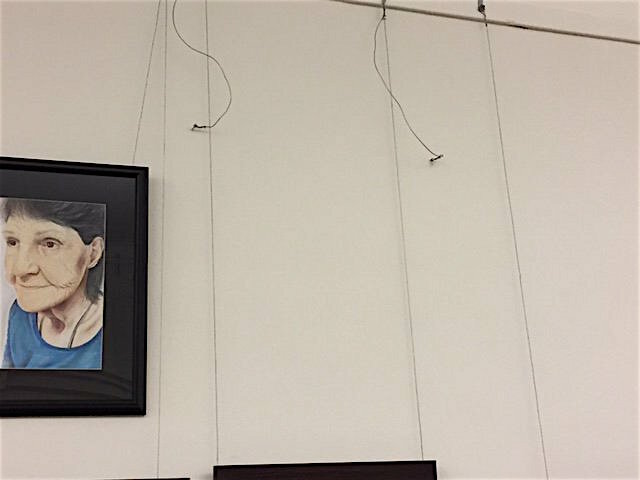 This set off a chain reaction during which Congressional Black Caucus members re-hung the painting several times after Republican so-called Freedom Caucus white congressmen ad-hoc removed the painting. Hunter has developed a reputation for erratic behavior for everything from smoking an e-cigarette vaporizer at a House committee meeting, to opposing his own legislation on drafting woman into the Armed Services to flying his pet bunny rabbit around the country on campaign dollars. And oh by the way, bursting out into uncontrollable laughter, according to The Hill, this week when told some other members of Congress considered President Trump’s behavior to be unhinged. Yeah, how crazy is that? But what got him served was the tug and pull of pulling down an award-winning high school student painting about Ferguson, Mo, from the Capitol’s walls because he disagreed with the portrayal of a police officer as an animal resembling a wild boar. “Seven months after being displayed as part of a public exhibit, a deluge of alternative right media, aided by the unauthorized actions of certain reactionary members of Congress, deprived Mr. Pulphus of his constitutionally guaranteed 1st Amendment Right of Free Expression,” Clay’s office said in a statement to the St. Louis Post-Dispatch. Clay’s office said he “is seeking an appropriate remedy through this federal litigation and he is proud to defend both the fundamental rights of his constituent and the 1st Amendment,” according to the Post-Dispatch. Pulphus’ “Untitled #1” won Clay’s Congressional Art Competition. The piece shows a protest against police violence and depicts police officers, as well as one protester, as animals. Clay attempted to return the painting to its display permanently. However, after Republicans argued that the painting did not meet the competition’s standards, which bars works of art that depict “subjects of contemporary political controversy or a sensationalistic or gruesome nature,” the architect of the Capitol ordered the painting removed. Clay said he is “proud to defend both the fundamental rights of his constituent and the 1st Amendment,” and will seek an “appropriate remedy” through the federal litigation. His suit will reportedly name the Architect of the Capitol as the defendant, although it’s not clear if the congressman will seek a financial “remedy” or just that the painting be returned to its “rightful” spot on the wall. Representative David Reichert (R-WA) called the painting a “slap in the face” to law enforcement and claimed it violated competition rules. His suit was filed pro-bono by Leah J. Tulin, of the D.C. office of Jenner & Block, LLP, and James M. Williams, a personal injury and business litigator with the New Orleans firm Chehardy, Sherman, Williams. Be the first to comment on "Hunter served over tearing down high school painting that made him ‘angry’"